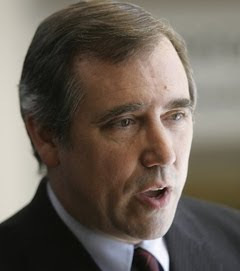 I saw first hand what Merkley was able to do as House Speaker in Oregon leading a narrow majority. Adopted policies far more progressive than the conservatives in his party wanted, but got them on board through a wide variety of tactics. My only correction to your post is he's not up for reelection until 2014 since he was first elected in 2008. You write 2012. Great post, Neil! I'm always looking for ways to make my political contributions as useful as possible. We've really done quite well with the Senate freshman classes of 2006 and 2008, and even in that group, Merkley's been a standout. I'll definitely be sending some money his way. I noticed that he's contributed to the campaigns of Dem challengers Carnahan, Hodes, and Melancon (MO, NH, and LA, respectively). While Melancon would be the Senate equivalent of a Blue Dog, he'd still be a mile better than Vitter, and he's got a fighting chance against Diaper Dave. And if guys like Merkley are in a position to say to him in the Senate cloakroom next year, "hey, friend, remember that I helped you out when the odds were against you," that might help us keep Melancon on board for a few key votes. Yeah, that's what I'm hoping for, ltc!